Our retail nursery is open to the public all year. Seasonally our hours change, so before heading our way, please call ahead to confirm current hours. We of course offer a large selection of our grafted conifers but also offer a great selection of Japanese Maples. Our maple selection is in house production offering many varieties difficult to locate. 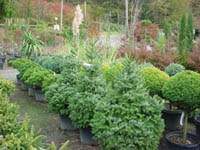 The retail facility specializes in woody plant material, while also offering flowering trees, shrubs, selected ground covers, vines and grasses. In the early spring, we offer a small selection of fruit trees and blueberries, and in the late spring, you’ll want to pick up one of our famous ‘Earli-Wonder’ tomato plants! Perennials and bedding plants are not among the product line. Simply, if you are looking for material to set your landscape in motion or that certain plant for that singular location, Wells will meet your expectation.